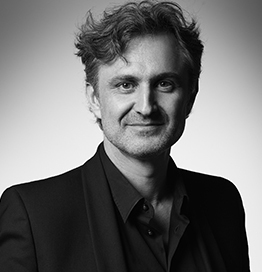 Following his international studies in marketing between Paris, Berkeley, Tokyo and Beijing and a design training at the Milan Domus Academy, Christophe Pradère began his career in Asia as Brand Design Manager for a skincare brand, thus continuing his worldwide adventure. Three years later, on his return to France, he successively joined the brand consulting pole for a packaging design agency and then an architectural office as Project Director. His career then led him to Euro RSCG Design where he was responsible strategically for the corporate pole and creatively for the retail pole, earning the trust of numerous major brands. At the end of 2000, Christophe Pradère created a global design entity for the innovative and prestige industries markets, integrated in the heart of BETC Euro RSCG, that he renamed BETC Design six years later. As founder and CEO of the agency, he rapidly grew it to reach today’s level of a total of 45 employees. Christophe Pradère specialized in global design approaches and in design management both in the creative and innovative industries markets. Today, Christophe Pradère creates his brand experience through a holistic approach to design, enriched by anthropology and sociology. He founded a new global strategic and creative method, expressed in the concept of brand rituals. With this methodology, the brand experiences can be developed through the creation of products, services and places. Alongside his activities in developing his agency, he intervenes at several higher level educational institutions such as the Parsons School, ESSEC and SKEMA.